Flipkart recently announced its Big Billion Days sale which will kick off on October 10. The online retailer says that during the sale, it will offer considerable discounts on smartphones, laptops, TVs, large appliances, speakers, headphones, and more. Flipkart is hosting its Big Billion days sale from October 10 until October 14 and the online retailer is promising good deals and discounts across a wide range of devices this time. Apart from the incessant promotions and marketing, Flipkart has detailed some of the offers, which will be available during the upcoming sale. 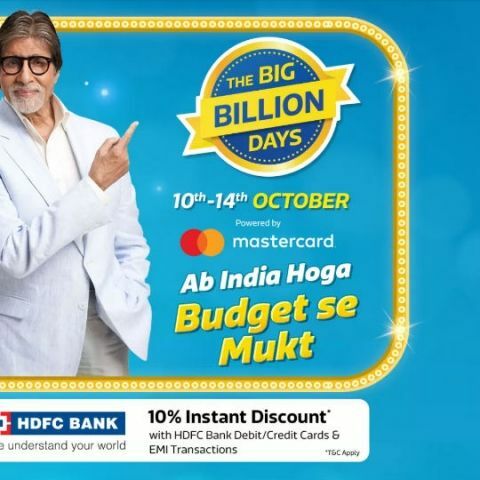 Buyers using an HDFC bank debit/credit card will get to avail a 10% discount when purchasing products and this offer is valid on EMI transactions as well. On the first day of the sale, Flipkart will be offering discounts on gadgets like TV’s and other appliances, smart devices and more. From the second day, October 11, smartphones, gadgets and other electronic accessories will be up for grabs at reduced prices Flipkart already has dedicated microsites up for promoting the sale where it mentions that TVs will be up for sale with up to 80 percent off, along with large appliances, speakers, cameras, tablets and more. Let’s take a look at some of the biggest deals that have been revealed by Flipkart so far. Flipkart has revealed that under “Crazy Deals” sale, the Samsung Galaxy S8 will be available at Rs 29,900 with a no-cost EMI option starting at Rs 3,333/month. Additionally, the Lenovo K8 Plus will be on sale at Rs 6,999, while the Moto Z2 Force will cost you Rs 17,499. Some Honor smartphones will also be discounted like the 3/32GB and 4/64GGB variants of the Honor 9N, which will be available at Rs 9,999 and Rs 11,999, down from Rs 11,9999 and Rs 13,999 respectively. The Honor 10 will get a discount of Rs 8,000 and will be priced at Rs 24,999, while the recently launched Honor 7S will be available at Rs 6,499. The Honor 7A and the Honor 9i will be discounted by Rs 1,000 and Rs 2,000 discount respectively during the sale and will be available at Rs 7,999 and Rs 12,999 respectively. Alongside regular deals and discounts, Flipkart will also offer limited period deals on some select products. There will be some “Crazy Deals” too, which will refresh after every 8 hours during the Big Billion Days sale to host new products at a discounted price. One will also get to avail additional discounts in the first two hours of the sale and there will be flash sales going on that will feature 120 deals for over 120 hours. Like Amazon Prime member get exclusive access to their sales, Flipkart Plus members will also be able to access the deals three hours earlier than anyone else at 9 PM on October 9 and 10.